My chest has been dominated by black. The mermaid (not in view here) is partly coloured now, but quietly. Today I asked Ben to be bold with the flowers and he has been. As the tattoo heals it will become more yellow. I hope as the work on my chest progresses it will become more and more vivid. It is hard for someone who is very heavily tattooed not to be fascinated by face tattoos. They make the person look so beautiful in my eyes. But to have your face tattooed in this way means marginalising yourself from society. So it's hard to see how I can do it and live my life so I shall have to satisfy myself with face painting. 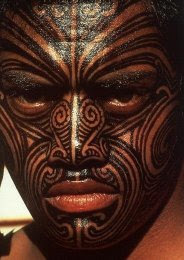 Yet the Moko has a tremendous pull and attraction to me. If only I could have one. There is sadness and lament in those words. The lines follow the contours of the face and serve to magnify the beauty of the human form. It allows the tattooed person to age with dignity and grace and makes you look grand and strong. the piercings add to the glamour. Many have their noses with huge rings and their ears elongated. Glorious. Yet you only have to look at message boards where people discuss their take on people with tattooed faces to know just how revulsed the western majority are by their image. When I had my back piece done I started with virgin skin. This meant the design could be an integrated coherent piece of art. Now that I'm finishing the rest of my torso, I face a bigger problem. I already have a number of tattoos on my chest and stomach and they are in black. My back is in colour. Now I am trying to make the whole torso look all of a piece and to make the existing tattoos blend into the part body suit..